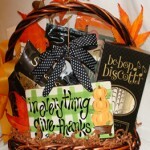 In Everything Give Thanks is a great basket for anyone you want to thank. 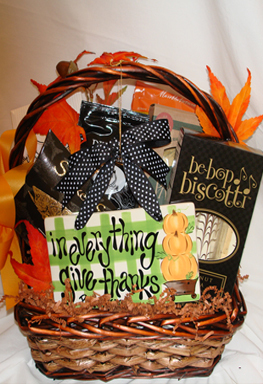 Remind your loved ones to be thankful for the little things with a basket full of delicious little things. 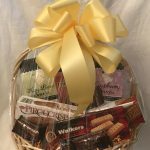 Assorted cheeses, crackers, fresh apples, smoked salmon filet, flavored coffee and gourmet biscotti are a sweet and savory reminder of how much you care. Sometimes life gets hectic and we forget to stop and think about the everyday wonders that make it so wonderful. Give your loved ones a little piece of wonderful – say thank you or simply remind them of how much they mean to you. 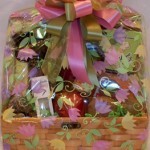 As always, this beautiful basket comes complete with a cellophane-wrap, a hand tied bow and your personal message in a hand written card. The ceramic plaque, “In Everything Give Thanks” is the artwork of artist, Carla Grogan. A keepsake wall plaque by Carla Grogan will be a constant reminder of your thoughtfulness. Swiss or Cheddar Cheese, Partners crackers, assorted mixed nuts, smoked salmon, Perfect Pot coffee and biscotti will be consumed readily, but the thoughtfulness of this gift will be with them for a long time. 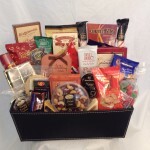 Basket contains:Assorted cheeses such as Swiss and cheddar, wheat crackers, smoked salmon filet, nuts, fresh apples, flavored coffee, cookies, biscotti and a ceramic wall hanging plaque as shown.